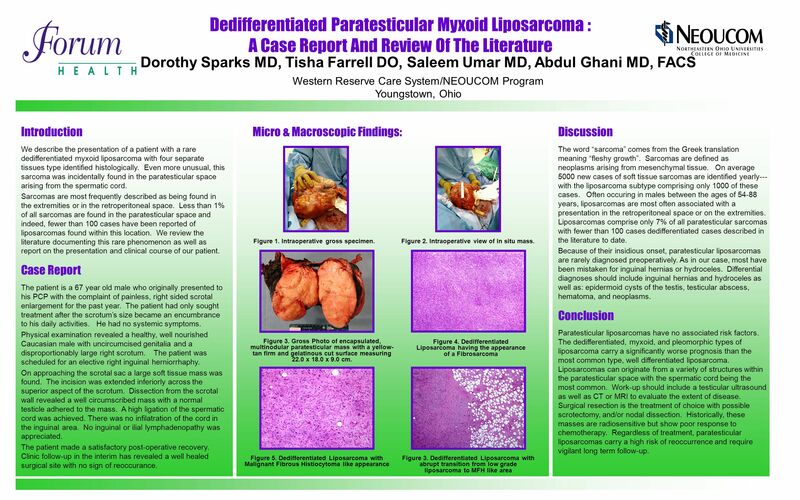 Download ppt "Dedifferentiated Paratesticular Myxoid Liposarcoma :"
Testis Often difficult to differentiate a serious emergent situation from a more benign situation Pay attention to history, clinical picture and pain expression. Radiologic Imaging Defines the local extent of a tumor Can be used to stage malignant disease Aids in the diagnosis Monitoring tumor changes after treatment. FOLLICULAR DENDRITIC CELL SARCOMA R4 洪逸平 /VS 顏厥全大夫 財團法人台灣癌症臨床研究發展基金會. Tumors of the Diaphragm. The diaphragm is commonly involved with malignant pleural disease or malignant peritoneal disease. Only rarely, however, is the. Vasculitic Infarction of the testis – Is organ sparing possible? Introduction Testicular infarction as a result of systemic vasculitis is an exceptionally. Case Report History :26 year old caucasian male presented complaining of an intra oral swelling involving the gum margin of the upper left jaw. He gave. Station 1 40 years old lady complaining of Para umbilical hernia,examine her abdomen? Case Study 12 Gabrielle Yeaney, M.D.. 19-year-old man with a past medical history of ALL who presents with a several week history of intermittent falls. The patient is a 65 year old man with a history of hypertension and valvular heart disease who presented with spontaneous hemorrhage of the. Scrotal Lumps Kieran Jefferson UHCW. Current practice 4% of TWW referrals for suspected testicular cancer found to be malignant in recent audit Most commonly. PRENATAL DIAGNOSIS OF A LARGE PLACENTAL CYST WITH INTRACYSTIC HEMORRHAGE OB8. S.BELABBES,S.BELLASRI,S.CHAOUIR,T.AMIL,H.EN-NOUALI A RARE MEDIASTINUM TUMOR: THE PRIMARY LEIOMYOSARCOMA Department of Radiology, Military Teaching Hospital.